Play as one of two characters with unique storylines, monster encounters, and gameplay challenges. Navigate a multi-story maze that grows scarier, harder, and more twisted as you struggle to escape the madness. 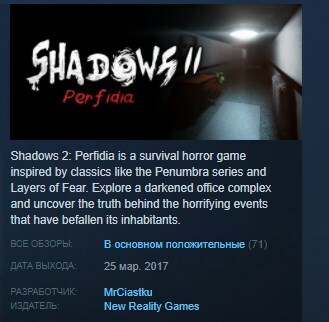 Shadows 2 combines elements from your favorite indie horror titles and drives them to a new level of terror. Confront over three types of monsters, each with distinct behaviors and tactics. Use darkness to your advantage and evade the creatures’ deadly threats. Solve diverse, interesting puzzles to access each floor’s elevator and advance the story, a mind-bending tale of betrayal and revenge. Master a unique sanity system that allows you to stave off trauma by guzzling energy drinks or shutting your eyes against the chaos. Witness too many horrors, and feel your mind unravel. The world of Shadows 2 is packed with details, from menacing sound effects to cleverly plotted jump scares and disturbing set pieces. In addition to the main story, each floor contains secret items that can be collected to unlock behind-the-scenes content and design documents. Are you brave enough to embrace the Shadows?